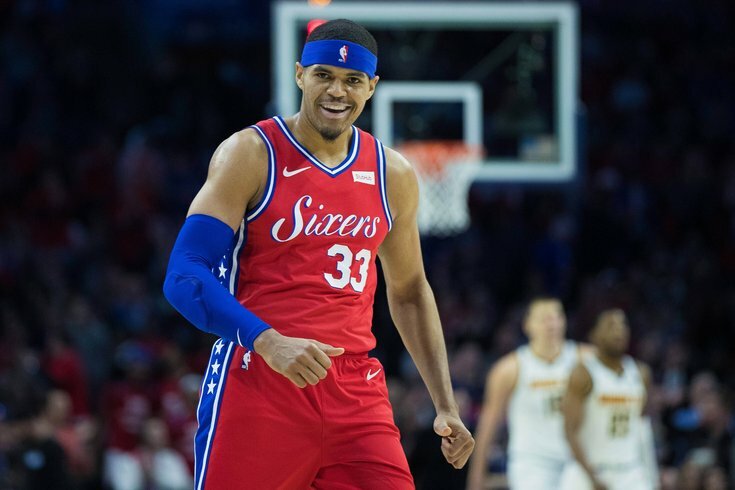 Philadelphia 76ers forward Tobias Harris (33) reacts after a score against the Denver Nuggets during the first quarter at Wells Fargo Center. The Sixers had to incorporate a bunch of new pieces in a national TV game against the Denver Nuggets on Friday, and they made it look like no problem against one of the league's best teams. Behind a big JJ Redick performance and a balanced attack elsewhere, the Sixers earned the first win of the new era, 117-110. Not a bad debut for Tobias Harris. In front of an electric crowd in Philadelphia, the Sixers showed off how good they can be already as they figure out how to get everyone on the same page. Here's what I saw during a fun night at the Wells Fargo Center. • Bringing out the majority of the 1982-83 title team to ring the bell, on the night the Sixers retire Moses Malone's number, was a very nice touch. And Ron Brooks singing the anthem was predictably great as usual. • There's no way to win a trade within days of the trade happening. But if you want to get on the good side of a new fanbase, there's no better way to win them over than to come out firing in your first game. Tobias Harris absolutely did that. Harris missed a shot around the rim on the team's first possession, but it became clear pretty quickly how big and tough this group is going to be. The Sixers made life miserable for the Nuggets on offense — where they are one of the league's elite teams — and by simply giving them another above-average defender in crunch-time, the Sixers' defensive ceiling has been raised to a new level. Of course, Harris is another useful cog in Philadelphia's offensive machine.After he knocked down his first shot, a three in transition, Harris made sure to play to a crowd that was already buzzing for his debut. Moments later, he scored again, and then set up JJ Redick in transition to force Denver into taking a timeout. He played exactly as advertised in his first game in Philly, and I imagine this guy is going to fit in with this city and team just fine. • JJ Redick came out absolutely scorching against Denver and never really let up. There will be guys who lose touches and shots in the wake of this trade, but I doubt he's going to be one of them. He's one of the most dangerous shooters in the league, and the ball will continue to find its way to him. And, by the way, he may be the biggest beneficiary of the new setup in Philadelphia. Teams have a lot of respect for the scoring talents of Harris and Butler, which makes it easier for Redick to slip between the cracks. When the doubles crash on Embiid in the post, Redick is often just a pass or two away from a wide-open look. On top of all this, they are a bigger team than they were pre-deadline, which puts more credible screeners on the floor to free him up. All he has to do is knock down the looks. Easy money. • We kinda sorta got a three-point attempt from Ben Simmons! That didn't look completely terrible, which is as much as you could hope for with a guy who doesn't ever take them. Baby steps, etc. Simmons had a couple highlight-reel plays against Denver, both of which came on fake dribble handoffs. With the number of shooters the Sixers can put on the floor in crunch time, I wouldn't be surprised if he can constantly exploit that opening over the coming months. • It certainly wasn't an overwhelming performance from Jimmy Butler, who has had mysteriously little scoring juice on drives lately. But he came through on some broken possessions in the final two quarters when they really needed him to score, and that's exactly why he was brought here to begin with. I thought Butler did a good job adjusting to his new reality as a teammate. He didn't dominate the ball and made good use of the possessions that came his way, playing unselfish basketball throughout the night. Is he going to be happy taking more of a backseat on this team? No one can answer that yet. But he showed he's capable of doing so and still thriving in our first taste of the new-look Sixers. The flipside of this is that he really needs to stop turning down open looks from three. The Sixers are generating looks for him that he has confidently taken and made at times in the past, and he has been gunshy for no real reason. If unselfishness is the main complaint, they'll live with it. • Here's the best thing you can say about this performance from the Sixers: they were very clearly not at their best, nor should they have been expected to be with so many new pieces. Their MVP candidate was off all night, and they blew a decent-sized lead, as is custom. And they still won a game against a very good Denver Nuggets team, because they simply have too much high-end talent to be stopped at times. They can now bail themselves out of more bad possessions, hit a higher level when they're firing on all cylinders, and get wins against elite teams without their best stuff. That's quite a luxury, and not many teams in the league can claim the same. They will be a problem when they put it all together. • Joel Embiid has been battling an illness for most of this week, so it should come as no surprise that he didn't look like himself on Friday. It was a bummer, because the Embiid-Jokic matchup is one many people (including yours truly) have looked forward to all season, and we got a neutered version of what should have been a marquee matchup. Even still, credit to Embiid for fighting as he usually does on the defensive end in spite of the tough night, coming up with some insane defensive plays while fighting through sickness. He rallied in the final moments of the game to bring the Sixers a victory, and if anything is clear, it's that you should never question the guy's competitive spirit. • The Sixers were almost a little too unselfish at times on Friday night. Harris passed up a couple open looks that I think he would normally fire on, and to be clear, that's a good problem to have early on. You don't want someone coming in and trying to hijack the offense, and he'll find his way eventually. But they brought you here to score, brother. Don't be shy. • If Ben Simmons is going to dominate the ball as much as he did on Friday, he damn sure better take better care of it. There are too many talented offensive players on this team for him to give away possessions with careless passes, or by getting trapped under the basket without a plan. • I am not entirely sure what Brown was doing with the rotations throughout the evening. Yes, this is a new group, but it shouldn't be as hard as the Sixers made it look to put together a rotation. At one point in the second half, the Sixers had a five-man group on the floor of McConnell-Butler-Ennis-Scott-Boban. The entire point of trading for a player like Harris is to stagger lineups so you never have to go without 2-3 of your best players on the floor at the same time. Brown ran out some downright weird combinations, and for no real reason. We'll have to see how this unfolds over time, but I did not get the logic behind a Butler & four bench guys lineup.